So it turns out we’re all a little bit hard-wired for rewards. We love a little bit of pleasure. Our Nucleus Accumbens, located in the ventral striatum, does loads to help us choose what we want, when we want it. It’s conveniently connected to the hippocampus (memory), frontal cortex (higher order decision making), amygdala (motivation and encodes potential costs of our decisions) and VTA which produces the all-important pleasure seeking chemical, dopamine. So in short the Nucleus Accumbens (NA) is a hefty emotional calculator with access to good data to calculate values for our decisions. What a perfect region to make some purchasing decisions! Yes I love that car. But is it too expensive for my budget this month? And will it in my garage? So how do we know there even is a relationship between our brain’s activity and us choosing pleasurable rewards? Wolfram Shultz’s study in 2006 showed that the more the animal got their reward, the more the dopamine neurons in the NA fired. However, after a while they stopped firing when the reward was presented, and started to fire in anticipation of the reward. So it was expecting the reward. Show us a cue for the reward – like the smell of a cake baking – and the brain releases our dopamine in pleasure-driving mode. The cake needn’t be eaten yet, but the cue kicks us off. What does this mean for addiction? Self-administered drugs (e.g. 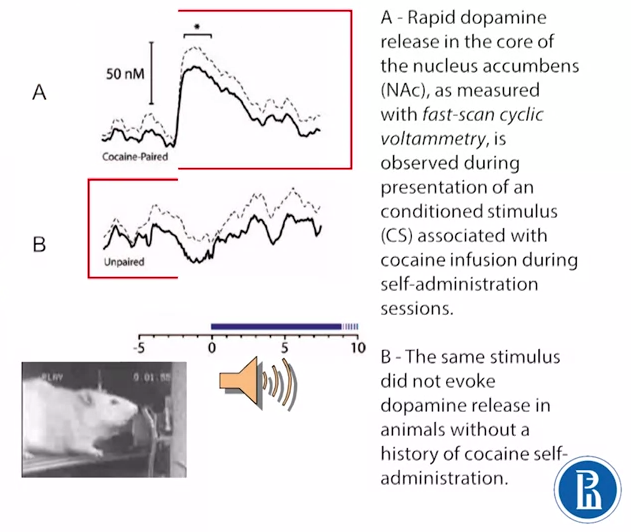 cocaine, amphetamine) have been proven to hijack the dopamine system in animals and directly evoke a pleasant reaction by manipulating the pleasure system to mirror these expectant brain patterns. So in short, our NA dopamine neurons will fire more when the person values something they know, even if they haven’t tasted it yet.